Choosing a quality child care setting can be challenging with long waiting lists, various types of child care and the unique requirements of your child and family to consider. It is important to start early and know that there are services available to assist you with your search. Choosing a child care option is a significant decision for you and your child. We provide information and resources to assist you in your decision making process. Looking for information on the Affordable Child Care Benefit? See the information below and contact us if you have any questions. Our online child care search portal allows you to search Vancouver child care options by age, type of child care, location and more. Find out about typical child care costs for the various types of child care with our most recent fee surveys. We offer community based child care information sessions by request, resources and more. It can be a challenge to find a child care arrangement you feel comfortable with. Here are some ideas that might help you make your choice. Is there a space for your child? What is the caregiver’s experience and training in child care? For more information on gathering information and tips for visiting a potential child care provider download Choosing Child Care (PDF). Looking for child care in Vancouver? 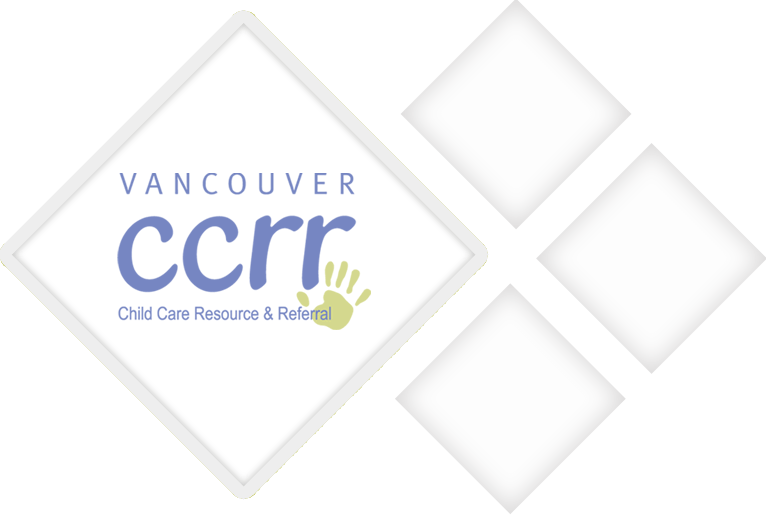 Utilize WCCRC's online search tool and filter by location, neighbourhood, age, type of child care and more! For information on child care fees within the City of Vancouver view the most recent fee surveys. The Affordable Child Care Benefit replaces the current Child Care Subsidy (2018). The new funding will help families with the cost of child care, depending on factors like family size, type of care and household income. Try out the online Affordable Child Care Benefit Estimator, apply online or learn more. For support completing the Affordable Child Care Benefit application, book an appointment with one of our WCCRC Parent Service Advisors. Email parentservices@wstcoast.org or call 604-709-5661 OR 604-709-5699.
on Choosing Child Care for new parents in the community. These are the various types of child care options available to parents and caregivers. These categories are provided by the Government of BC. Full day program, typically 12 children in a group. One educator for every 4 children. Full day program, typically 25 children in a group. One educator for every 8 children. Part day program, 4hrs or less, often operating during the school year. 20 children in a group; one educator to every 10 children. School age programs serve children who require care outside of school hours. One adult with minimum of 20 hours training per 10 children. Serves smaller groups of children, typically 8 children in a group; one Educator for each group of 8 children. Occasional child care is care for children who are 18 months or older. Care is provided on a part time or occasional basis only. A maximum of 40 hours per month with no more than 8 hours of care per day. Offered in the child care provider's own home; serves a maximum of 7 children from birth to age 12. Providers are registered with a Child Care Resource and Referral Program and have met a number of provincial standards. care for 2 children or a sibling group, not related to them by blood or marriage, at any one time. Offered in the child care provider's own home; serves a maximum of 8 children from birth to age 12.